Dynamic Seating is often used to prevent equipment breakage. Some clients who use wheelchair seating exhibit increased muscle tone. This is common in clients with diagnoses such as cerebral palsy, traumatic brain injury and Huntington’s disease. Increased muscle tone or spasticity is caused by an imbalance of signals from the central nervous system to the muscles. In addition to increased muscle tone, primitive reflexes and involuntary movements may also be present. So how does increased muscle tone lead to equipment breakage? Muscle tone is not a constant state. 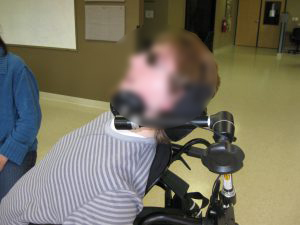 Many clients may appear to be quite relaxed while sitting in their wheelchair seating system. However, a number of factors can lead to sudden and forceful extension, particularly at the hips, knees and neck. This extension is often maintained for a short period of time and then subsides. The forces from this extension on a static wheelchair seat and frame can be so strong as to cause damage over time. Hardware used to mount the seating system and components (such as a head support), are particularly susceptible to damage. Breakage frequently occurs at the footplates, footrest hangers, back mounting hardware and head support hardware. These forces are not entirely dependent on the client’s size. Even very lightweight clients can exert enough repeated force over a period of time to lead to breakage. Dynamic seating is designed to absorb these extreme forces which, in turn, protects the wheelchair seating and frame from wear and tear and even breakage. I have worked with a number of clients who have broken components in the past until using dynamic seating. Less breakage means our clients can use their equipment with less repairs, less interruption to life and less funding and documentation hassles for providers! Thanks Sharon! We appreciate all the wonderful seating education you provide around the world! Michelle appreciate the article (s) Have used it several times in past for head trauma or C.P. with periods of high extensor tone that broke back canes or headrest hardware. Definitely a needed component for those clients. Thanks Missy! Dynamic components can definitely prevent breakage when used with clients who have high tone. We have used many types of dynamic components on our backrests at our facility and can say honestly that the only style that has been successful has been Seating Dynamics backrest interface. Not only is it sturdy and holds up well for longer periods of time, it easy to maintain and adjust for changes. Thanks for the comment Suzanne! Just as some clients exert sufficient force to break static components, dynamic components must be durable, as well as provide movement. Providing both durability and movement can be challenging! I’m so glad you are seeing great results in the clients you serve!